My four-year research project ‘Securing Private Communications’ is coming to an end. A grande finale of sorts is my public defense ceremony on 25 November. The ceremony is open to the general public, and the venue is humongous, so you’re all very welcome to join me. 11:00 – ‘Lekenpraatje’ (short talk by me for non-experts). 11:10 – Start ceremony with a procession of the Committee. 11:10 – Questions by each Committee Member about my thesis. 12:00 – Evaluation of my answers, ‘backstage’ by the Committee. 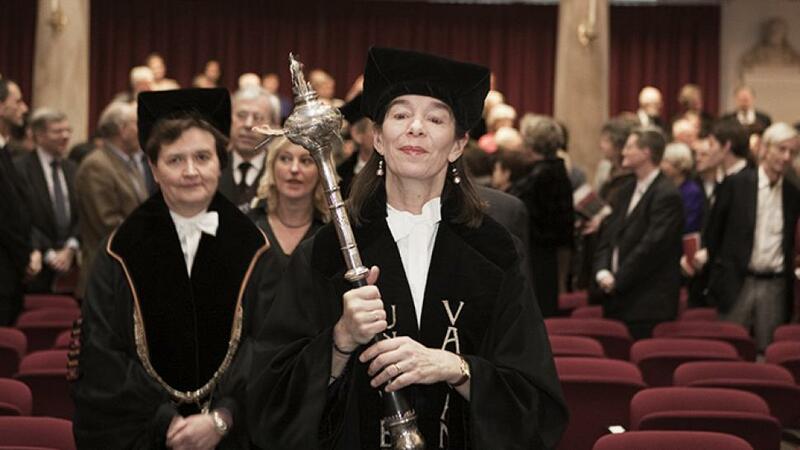 12:15 – Result and, if passed, handing over of the doctorate. 12:30 – Reception with drinks and bites. 14:00 13:30 – End (we need to make way for the next group). The public defense is the culmination of a peer-review process, that started months (or in fact, four years) ago when my supervisors Prof. Nico van Eijk and Prof. Natali Helberger gave the go-ahead for me to submit my full manuscript to the Committee, consisting of four University of Amsterdam professors and three from other universities. Six weeks later, the Committee decided that the thesis was fit for defense. In the meantime, and weeks after, I worked on the camera ready ‘academic version’ of my doctoral thesis. The print edition – with rigorous editing and updates to include recent developments such as the CJEU safe harbor judgement – will be published by Kluwer Law International in a few months, by the way the first time they ever publish a work in these series under a Creative Commons license. The full title of the thesis is Securing private communications – Protecting private communications security in EU law: fundamental rights, functional value chains and market incentives. Communications security has become a major concern for law- and policymakers around the world. The continuing string of Snowden disclosures, breached iCloud accounts of megastars and successful hacks of cars cruising the highway are just some of the countless prominent examples of severe incidents, that illustrate our dependence on private communications security and make us realize that our private communications are systematically insecure. In response, the EU lawmaker has launched several sweeping reforms of EU communications security legislation in the last two years. Against this background, the study chose as its central research question: how should the EU lawmaker protect private communications security? The study contains the first in-depth historical analysis in the legal literature of over three decades of EU communications security law (Part I). Subsequently, the study researched concepts and tools for the EU lawmaker in fundamental rights law, computer science and the political sciences (Part II). The study then developed a procedural model for EU communications security legislation, which was tested in two case studies on communications protocol HTTPS and ‘cloud’ communications through the lens of the Snowden disclosures, operation MUSCULAR in particular (Part III). Afford protection along the entire functional value chain of networked communications, rather than merely to ‘personal data’ or a narrow set of market actors. Use the analytical model of Part III as a new departing point for protecting private communications. If the EU lawmaker fails to integrate the first four recommendations, EU law is at serious risk of repeating conceptual shortcomings of the past, of reinforcing existing systemic vulnerabilities and market failures, as well as leaving the fundamental rights of 500 million citizens insufficiently protected. The study adopted a multi-disciplinary approach, combining legal research methods with insights and original research from computer science, security economics and the political sciences. It is the first academic study of its kind on the thorny conundrum of securing private communications through EU law. Carrie Underwood is my favourite US singer. She is young, beautiful and charming woman in her 30s. Her strong voice takes me away from all issues of this planet and I can enjoy my life and listen songs created by her. Now she is on a Cry Pretty 360 Tour started in May of 2019. The concerts scheduled for the whole 2019, up to the last day of October. Tickets are available for all men and women with different income. If you are a country music lover as me, then you must visit at least one Carrie’s concert. All tour dates are available at the Carrie Underwood tour Lafayette. Open the website and make yourself familiar with all Carrie Underwood concerts in 2019! Today almost everyone visits YT or any other service to upload and watch entertaining videos, free films and other video content. But sometimes you want to download a video or a movie and the hosting doesn’t allow you to do it. That’s where Vidmate App is coming to help you. It allows you to download a video from may services, including Youtube, Vimeo, Vimeo and many other hosting services. To do this you just need to open video page and click “download”. Plus, the app is completely free of charge and has user-friendly UI with your Android smartphone! Download Vidmate APK now and start downloading very entertaining video to share them with your friends! http://loveawake.ru/ – Знакомства в Береговом. Сайт знакомств в Береговом бесплатно, без регистрации, для серьезных отношений.